The Carriage Trade Gallery, New York is showcasing the first exhibition of photographs by renowned architect, planner and theorist, Denise Scott Brown. The Carriage Trade Gallery, New York is showcasing the first exhibition of photographs by renowned architect, planner and theorist, Denise Scott Brown. The exhibition, curated by creative agency PLANE-SITE explores the importance of photography in communicating architecture. The words of the photographer herself, Denise Scott Brown provide the leitmotif for the exhibition with her words: “I’m not a photographer. I shoot for architecture - if there’s art here it’s a by-product”. The architect Denise Brown Scott is one of the leading representatives of her profession. Already back in the ‘50s, she recognised the significance of Pop Art as a means of understanding the American vernacular and the commercial strip and she communicated many of her ideas through her photography, as real visual research. Something really topical when you think of the undisputed yet underestimated power of the image in the here and now, when it comes to communication. But the fact is that photographs go viral in a blink of the eye, taking just a few seconds to spread their content and message across the globe. 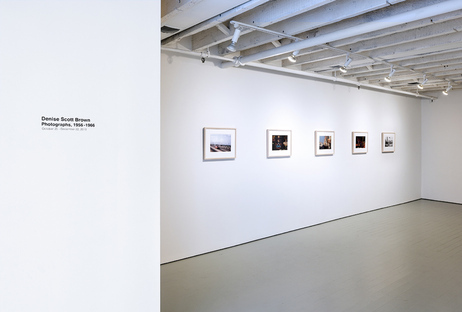 The first iteration of the exhibition titled Denise Scott Brown Photographs, 1956-1966 at the Carriage Trade Gallery in New York was at the 15th International Architecture Exhibition – La Biennale di Venezia as part of Time-Space-Existence. In addition to her photographs, the exhibition is also displaying reproductions of research material and films first produced as part of the Learning from Las Vegas project, a book written with her late partner Robert Venturi and Steven Izenour. Denise Scott Brown’s photographs pose a challenge to what was then the dominant Modernist orthodoxy of "pure" architecture which rejected ornament and representation. They propose an open investigation into urban sprawl and commercial iconography. She engages with the complexity found in the ordinary and in routine and focuses on the Pop aspect of the urban environment, conveying a symbolism often overlooked or rejected in architectural circles. Not surprisingly, Scott Brown and Venturi’s assertion that modernism veiled its own symbolism under the pretence of form obeying the dictates of function were then used as key arguments in the development of postmodernism. In proposing the significance of the image as a means of understanding and engaging with the built environment, Denise Scott Brown’s photographs from the ‘50s and ‘60s seem to have anticipated the explosion of visual culture within urban settings. As the static images on billboards yield to video screens, and mobile technologies expand the image world to the device in the palm of our hand, these pictures of the modern and historical city represent early, non-hierarchical investigations into the ongoing rapport between image and site. These photographs inspired much of the research on urbanism and representation that followed. The exhibition Denise Scott Brown Photographs, 1956-1966 at the Carriage Trade Gallery gives us an interesting opportunity to better understand the importance of images in the narrative of a place, particularly nowadays, where rarely do we explore the creation, and the content, of our dominant means of communication - the image. The exhibition is accompanied by a catalogue, published by PLANE-SITE and featuring texts by Scott Brown and Andrés Ramirez.